This mini meatloaf recipe is the easiest of meatloaf recipes because it portions out well and is a breeze to flash freeze. Right after we had our son, a sweet friend, Pennie, brought this to me as a baby meal. Four years later I finally got around to getting the recipe from her. I changed it up a little to fit our tastes. Now, I have to tell the truth, my husband is not a big fan of meatloaf, well, he just plain old doesn’t like it. But, it is very inexpensive to make and my kids love ground beef and ketchup, so you see my dilema? If you would like to really add even more flavor to the meat, I would recommend adding the bacon slices before you put on the sauce. 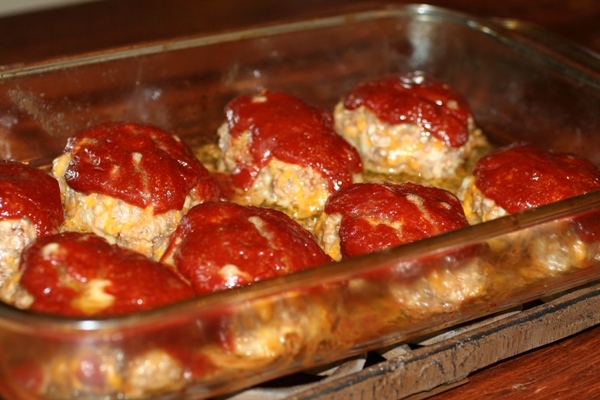 It is not mandatory, these mini meatloaves taste great without it, but the bacon just gives it an extra rich flavor. In a bowl, beat the egg and milk together. Stir in the parsley, cheese, oats, onion and salts. Add the beef and mix well. Shape into eight loaves and place on a broiler or drip pan. Optional: Cover each loaf with a piece of uncooked bacon. Cut each bacon slice into thirds and lay each third over one loaf, covering completely and tucking underneath. Combine ketchup, brown sugar and mustard. Spoon generously over each loaf. Bake, uncovered, for 45 minutes, or until meat is no longer pink.